This morning, a group of intrepid geocachers hiked along the front part of the south side of the W.G. Jones State Forest Area. A total of fifteen finds were had, including five different kinds of cache hides (traditionals, letterboxes, puzzles, multis, and an event cache). Even though it was approaching 95 degrees in the Texas sun, there was a little breeze going. Everyone was sweating and exhausted by the end of two and a half hours, but a really good time was had. 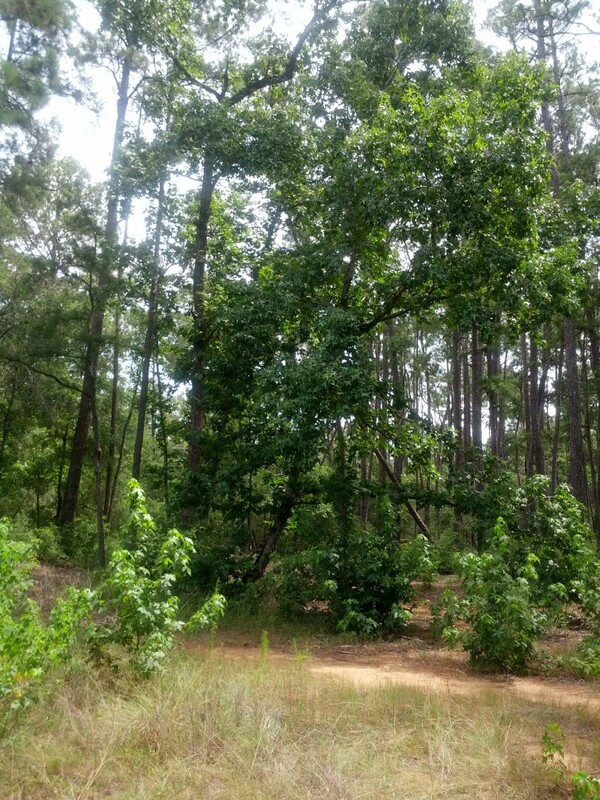 WG Jones park is named for William Goodrich Jones (1860-1950), who is touted as the “father of forestry in Texas”. He was born in New York, but his father was a jeweler from Galveston. When the Civil War loomed, this father, John Jones, headed back to Texas, soon to be followed by his wife and three children. They moved to Houston to escape the naval warfare, and then later returned to New York. After this, they went to Europe for two years. During this time, Goodrich visited the Black Forest, where he gained an appreciation of the beauty and advantages of a well-managed forest. He learned there the principle of sustainability, about when one cuts a tree from the forest, he should plant one in its place; a maxim which became an abiding principle in his life. Jones went on to obtain a degree in business from Princeton, and served apprenticeships in banks in Galveston and South Texas. He became president of a bank in Temple and established himself as a civic and business leader. He urged the townspeople to plant trees. Jones advocated the adoption of an official Arbor Day to promote tree planting statewide. The state legislature eventually established this day on the third Friday in January. Repeated trips through East Texas observing the lumber industry earned him an invitation in 1898 by B.E. Fernow, chief of the United States Bureau of Forestry, to make a survey of the Texas region and write a report on the condition and future of forestry in Texas. The resulting document became a blueprint for conservationists in Texas. Jones denounced the haste and waste of the large logging operators and predicted that under current methods the great forest would disappear within twenty-five years. 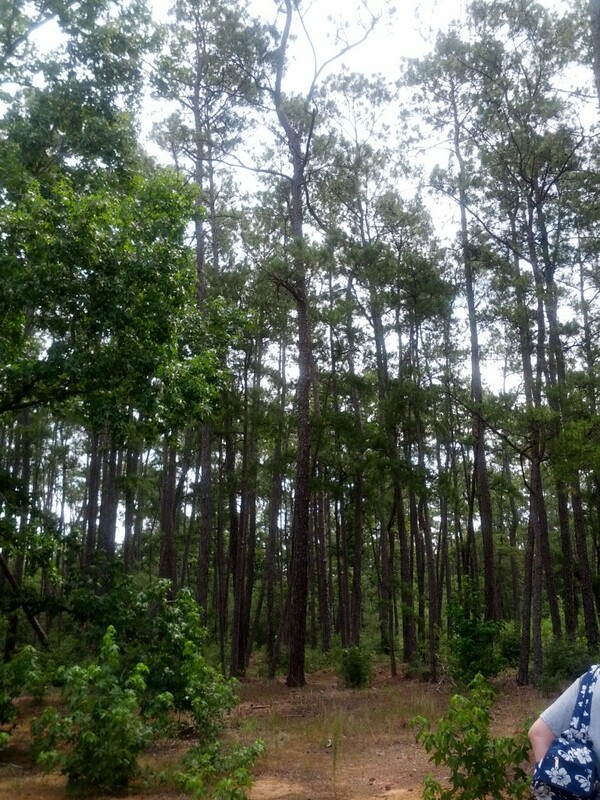 He recommended that the state and federal governments cooperate to regulate a planned-cutting, sustained-yield, systematic reforestation program that would prolong the life of the Texas forest indefinitely. Jones was not a wilderness advocate but rather a supporter of conservation for prudent use of Texas forests. He promoted the multiple-use concept of the forests in Texas and was interested in conserving the soil, grasses, and wildlife, as well as the trees. He also constantly urged the establishment of parks. To make every town a “green town” would, he believed, improve the lives of Texas citizens. After retiring from banking, Jones moved to Waco, where he managed his various properties and devoted his time to promoting the cause of conservation. He lived until he was almost ninety and was widely honored. He died on August 1, 1950, and was buried in Hillcrest Cemetery in Temple. W. Goodrich Jones Papers, Special Collections, Steen Library, Stephen F. Austin State University. Robert S. Maxwell, “Life and Work of W. Goodrich Jones,” Texas Forests and Texans, May-June 1964. Robert S. Maxwell, “One Man’s Legacy: W. Goodrich Jones and Texas Conservation,” Southwestern Historical Quarterly 77 (January 1974). Robert S. Maxwell and Robert D. Baker, Sawdust Empire: The Texas Lumber Industry, 1830–1940 (College Station: Texas A&M University Press, 1983). I just returned from a primatology conference in Puerto Rico, and of all the lectures I attended, my favorite one was one that had little to do with my day-to-day work, but shared some fascinating information that I want to share with you. 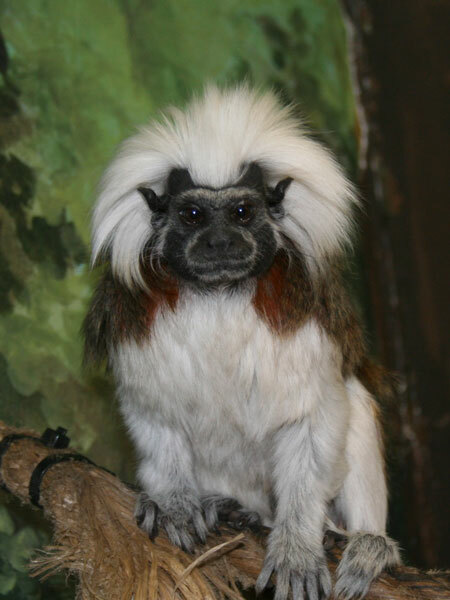 Okay, so here is the deal: my favorite animals are dogs, horses, and monkeys, and of all the monkey species, my very favorite is the Cotton Top Tamarin. Of course I love my long-tails, but if I could work with any monkey species ever, I would pick these adorable, flashy little moppets over any other. I really love the idea that there is a group out there, Proyecto Titi, that is trying to save these little guys, and are doing it in a really smart way. 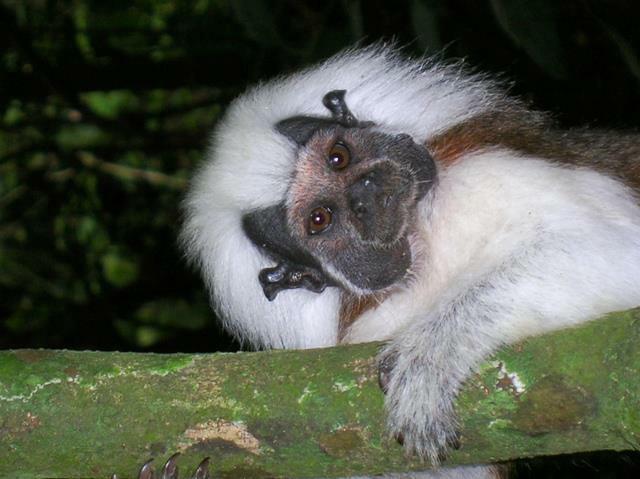 Proyecto Tití is essentially conservation program that combines field research, education initiatives and community programs to make the conservation of natural resources economically feasible for local communities in Colombia, which is where the cotton top tamarin is trying to hold out against extinction pressures. The program is designed to provide useful information to assist in the long-term preservation of the cotton-top tamarin and to develop local community advocates to promote conservation efforts in Colombia. In the talk I listened to, they discussed the efforts to first make a census of how many members of the species were left in this ecological range. Based on the methodology they came up with, it was estimated that there were about 7,500 of these guys left in the wild in 2005 or so. This low number, and the pressures placed upon the remaining members by deforestation practices and habitat destruction, led to a 2008 classification as Endangered animals. Proyecto Titi as a group was smart enough to realize that they could not just go into Colombia and start telling the people they have to save the monkeys. They had to figure out the reasons why the habitat was being destroyed, and work on reduction and replacement behaviors. They also had to integrate saving the monkeys into the culture of the this area. Bindes: One of the reasons for deforestation in the area is that the local people are still cooking their food over open fires. An average family of five burns 15 logs a day for cooking of meals. The conservation group was looking for alternatives, and realized that some families were using termite mounds as bindes, which is essentially a way to retain the heat and reduce the amount of firewood that needs to be used to cook. It is time consuming to find termite mounds for everyone, but the group realized they could craft bindes from clay that acted in the same manner. This was able to reduce the amount of firewood needed by families to 5 logs a day. Eco-mochillas: twenty years ago or so, there was no plastic in the environment of these little tamarins, but nowadays, it is a huge problem. There is no waste management in this area of the world. Trash is either thrown to the roadside, or burned. Plastic was accumulating in all areas, including the cotton top tamarins home range, further reducing the ability of the forest to survive. Mochillas are traditional bags made in Colombia. The conservation group had an idea and shared it with the local people, and it has taken off. What they do now is gather the plastic bags that are littering the environment, and then re-use them to create eco-mochillas; essentially, a purse crocheted from these plastic bags. Each bag is made from about 100-120 plastic bags. 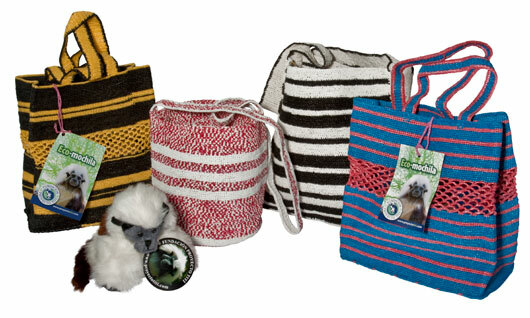 These bags are created now by a women’s cooperative called ASOARTESANAS that the conservation group helped organize. These women are pretty amazing! They decided they wanted to have a building dedicated to making these bags, and for community education on protection of the monkeys. After a year and a half of saving money, they were able to buy a parcel of land to put the building on, and then the Proyecto Titi group helped erect the building they wanted – the first two-story building in the local town. This women’s cooperative was also recognized globally for their efforts in 2012 by winning the United Nations Equator Prize, which is a highly competitive award, with over 800 nominations from 113 countries. You can view and purchase their products here. Community involvement and education: the conservation group has done an incredible job integrating their message into the local community. This has taken many forms over the years, but some of the neat things that they do include providing a textbook to 7-9 grade students that includes messages about conservation, sustainable practices, and the uniqueness of the Colombia habitat, particularly related to the cotton top. School children rarely have textbooks in this area, so this book is particularly treasured. Students who show a strong interest and leadership skills are then encouraged to be in a “Titi group”. These groups organize for various projects and some of the students go on to purse further advanced training in conservation biology, and come back to work for the group or support their aims. Also over the years, the group has organized a drive to exchange sling shots (used to hunt and capture animals for the pet trade) for a stuffed cotton top tamarin toy, created a National Holiday – August 15, the Day of the Cotton Top Tamarin, created a dance that is shared among the culture called the Cotton Top Tamarin Dance (to raise awareness), created and distributed posters and pamphlets, created a curriculum for high school students that involves teaching sustainable agricultural practices that preserve habitat, and initiated a “Waters of the World” conference that was designed to share international knowledge regarding water quality. There is a more complicated story involving that last one, and you can read more here about that and many of those efforts if you are interested. I was really excited to hear this story, about how a group who was interested in saving one really neat kind of primate ended up changing communities for the better, empowering women, and inspiring children to take better care of the earth around them to allow it to continue to thrive for generations to come. Plus, I am happy that because of the efforts of Proyecto Titi, the fascinating cotton top tamarins will have a place to call home not just now, but in the future to come. In the beginning of the book “Extremely Loud and Incredibly Close”, the main character, a nine year old boy, muses on the increasing world population in terms of where there will be room to bury all the dead. He throws out the idea that there are more people alive right now than have died in all the preceeding generations (snopes.com dispels this myth, but it is based on estimations), and envisions a world where we will have to have multi-story burial facilities to be able to handle all the dead bodies. I don’t think it will come to that, but I did laugh when I read that, and contemplated other solutions. My concern is that we will indeed run out of space for burial of human remains. Also, I would hope that we as a society move away from burial practices using embalming fluids and heavy-duty non-biodegradable caskets. Humans emerged as a species five million years ago, and formaldehyde was developed in 1867, so in the grand scheme of human history, it has not been long we have been using this method of preservation of tissue. There is potential for embalming chemicals, which are carcinogens, to leak into groundwater sources that lay below grave sites, and this is part of my concern for continuing this practice. Also, the land used for burials might eventually run out, or there may be need to turn that land into food production to feed this growing population of people. Cremation uses up a large amount of energy, and so for that reason, is also not believed to be an eco-friendly way to transform remains. 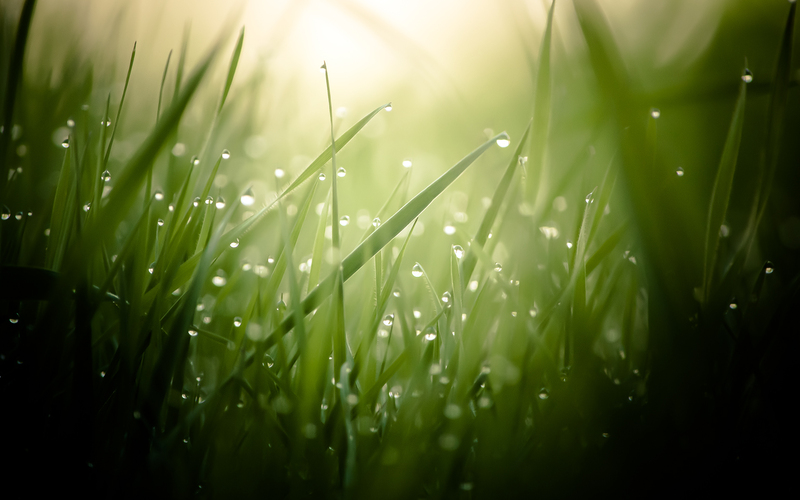 There is a small, growing number of cemeteries that offer green burial, in which the body is buried without the chemical embalming beforehand, and in by which process the body can return to the earth. As this takes up a large amount of space as well, this is not though to be the sustainable solution for our future. Eco-coffins made out of materials that readily break down in the environment are gaining momentum. There is a company called Eternal Reefs, which will take a person’s remains and mix it with reef material to add to the ocean to help restore fragile reef systems. 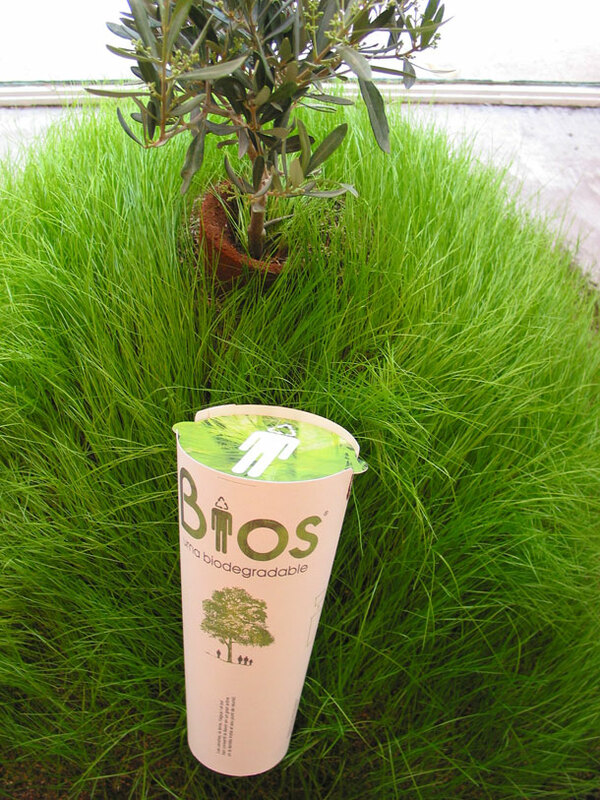 Some other new ideas that have come out recently are techniques such as alkaline hydrolysis, which turns the body into nutrients for the earth, or eco-friendly urns for cremated remains, like the Bios-Urn, which contains a tree seed and can be planted afterwards. You can choose to be any tree you like. I think there are probably other ideas I haven’t read about yet that are or will soon be out there to bring sustainable burial practices to today’s population. On my way home from work today, I was thinking about what I consider to be the key environmental issues of our times. Part of this thought process was stemming from a conversation J and I were having the other day about why he seems to have changed his mind about wanting to produce his own heir. He wondered out loud why anyone would want to bring a child into this world when the upcoming next couple of generations might suffer from what we foresee as a climatic disaster. Later on, I was reading a theory by a professor who published his vision of his future, which referenced humanity huddled in ice caves in a mere generation or two from now, as the rest of the earth will have become inhabitable due to climate change. It also doesn’t help these “doom and gloom” prophecies that I am currently (still) reading Alan Weisman’s “The World Without Us”. In order for Weisman to explain how the world would fare if humans were suddenly gone, he has to explain how we got to where we are in the first place, which includes not just humanity’s impact on the earth, but how the earth evolved before and during us. Weisman is very meticulous in his research, but he also expouses a worst-case scenario that gives a sense of urgency and dramatic results should we continue with our current paths. Anyway, I am sure none of us are oblivious to the fact that climate change is a major environmental issue we are currently facing. Ever since Rachel Carson published “Silent Spring” and the seventies ushered in a growing environmental awareness, we have been taking notice of the changes that are occurring around us. I am aware that some people out there do not believe that climate change or global warming is a real thing, and if you are one of those, I invite you to have a discussion where we try to see each other’s side of that. I think the grey area in this though is – what are the current impacts, what is our role in this, and what can we do about it? There is a whole host of literature I stumbled upon recently that implicates PCBs in reduced spermatogenesis in marine mammals, in changes in gender expression and sexuality in human beings, in reduced reproductive rates across the board and increased infection rates due to decreased immunity levels. There is a possible link between these PCBs and a higher rate of hermaphroditic polar bears. Also, in addition to the melting of our polar ice caps, polar bears are having to swim huge long distances to reach land masses to find food. If the polar bear does not adapt quickly (grow fins? webbed feet? ), they could be become endangered (currently their status is “threatened”). But PCBs are not the only factors in changing our air quality, which is in turn affecting our environment. Dioxins, which are by-products of residential wood-burning, fires, municipal waste incineration, and steel reclamation are also part of the sea of toxins we are introducing. You might have heard recently about Sheryl Crow stating that her breast cancer was caused by drinking out of water bottles left in the car. There is an urban legend going around that re-using plastic water bottles, especially after they have been heated, causes dioxin buildup and therefore, cancer to those who drink it (Snopes says there is little truth to this). Other culprits to our air quality include PAHs and mercury emissions. Climate change related weather events can spread these heavy molecules into all phases of our environment. Basically, what is happening is that there is a natural cycle of rising temperatures, which would then usher in a new ice age and yet change the landscape of the earth in specific ways that would cause change in ecosystems and organisms that live on it. However, this natural cycle is happening faster than it has before, at least to our knowledge, and there is a large body of evidence that shows that industrialization plays a role. As global temperatures continue to rise, and sea levels rise due to the melting of the ice caps, we will see a decreased ability to raise food to provide for not only our species, but other species on earth. Parts of the world currently in use for farming will be become lost to desertification. Imagine the American Southwest the new Sahara. It is this future that J doesn’t want to place his personal future generations into. I do wonder what kind of world my children will inherit; I spoke of this before. I keep telling my kids that I believe that the next world war will be over water rights, and some believe this water crisis (which is related to global warming) will occur within the next few generations. Basic things here; the ability to find water, food, and resources could be rapidly declining due to the effects of industrial revolution. I have a lot more I wanted to talk about, but this is already I am sure longer than the typical person’s blog attention span, so: to be continued. But I wanted to leave you, reader, with one last thought: when I was doing some reading into who was or will be the last prophet (because I was longing for God and wishing He would send another, or the Last, prophet down to us – or wondering why it has been so long since we have had one), I stumbled across this idea that is a little out in left field, but worth contemplating. A random Wikipedia author suggests that perhaps the Last Prophet is not a person, but the Earth itself, and how well we take care of it might be the defining lesson for humanity. If you were approaching Earth as a Prophet, what would it be teaching you – and what do you have to offer it in return?